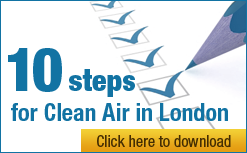 Areas around London’s busiest roads tend to be amongst the most polluted parts of the city. Find out if your home or your child’s school is near one and levels of diesel exhaust emissions on roads carrying over 10,000 vehicles per day on average. Is my child’s school near a busy road? Submit good information requests to find out something new about air quality using Freedom of Information/Environmental Information Regulation powers e.g. to your local authority, Transport for London, the Mayor of London, Defra or the Department for Transport. Emphasise your enquiry relates to ‘emissions to the air’. Use this site for guidance and consult the excellent guidance published by the NCVO. You might decide to start by asking your local authority for information it has gathered from nitrogen dioxide (NO2) diffusion tubes and/or reporting on them. Read Care4Air’s guide about them. The NO2 diffusion tubes may help you to identify where air pollution exceeds legal limits. The media has shown interest in such statistics. Why not ask the Department for Environment Food and Rural Affairs for the top 50 worst locations in your area for annual mean levels of nitrogen dioxide (NO2) for latest calendar year they hold i.e. specifying you want the latest for your area and the latest year that is equivalent to the information they released to The Sunday Times and was covered by the Mail Online and others? Have a look at the Public Health Outcomes Framework item 3.1 which provides estimates of deaths attributable to long-term exposure to dangerous airborne particles (PM2.5). The media has shown interest in such statistics.